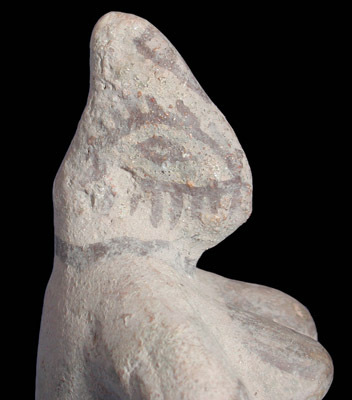 Exceptionally large, hand-formed solid terracotta stylized female figure. 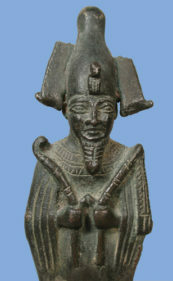 Characteristic of this well-documented and distinctive type, the head is summarily rendered, pinched slightly to form a narrow nose and pulled to a round point at the top. 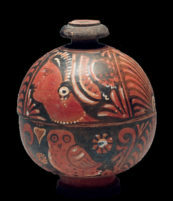 Umber paint indicates two boldly exaggerated eyes. 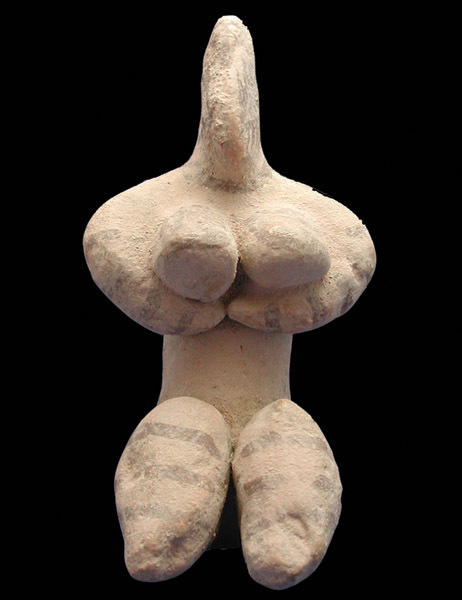 The figure has dominant protruding breasts with arms wrapped underneath. The legs are bent at the knees and end in tapering points. Brown painted stripes across the legs partially remain. 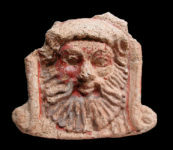 Tel Halaf figures are some of the earliest representations of the human form in clay. An exceptional example for its substantial size. Condition: Intact, with some minor abrasions to the bottom of both legs. 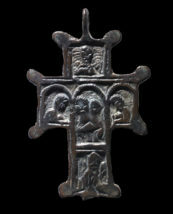 Provenance: Formerly in an East Coast private collection. Reference: See Figures #102 and 107 in Symbols of Prehistoric Mesopotamia by Beatrice Goff (Yale, 1963) for similar Halaf female figures.